Drum kit free vst DrumBox LM is Wav drum kit free vst developed by C Hackl with 150 drum sample library presets. 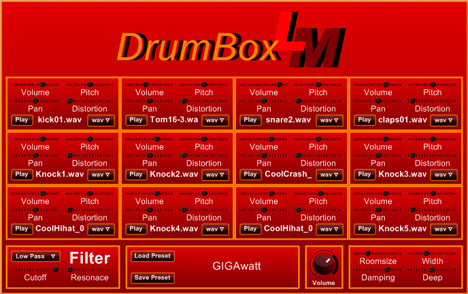 DrumBox LM is a 12 pad triggered drum kit with reverb, a filter and a distortion. With these additional effects settings, a professional music maker will craft fantastic drum sounds. Note: it’s possible that if you want to open a file, the file dialog start with a wrong path. The samples and presets are all in the folder where DrumBoxLM is installed. This drum vst runs in windows operating system, so you can go to the directory where the vst is installed.